I’m a novelty junkie. I like to try new activities, learn something I didn’t know, or discuss a new topic, idea or angle. One of my favorite things to do, ever, is try a new dish or type of cuisine: combines my love of food with novelty. I had to learn to cook because I wanted to be able to control the level of variety of my diet. Some may view this as intellectual curiosity. I call it, on my less forgiving days, a constant need to be entertained. On one hand, I have much energy and enthusiasm to explore the new and different. When I can indulge this need, I am engaged, creative, interested, and in the moment. On the other hand, I get bored easily when I am supposed to do a repetitive task, talk about a subject I find worn, take an exercise class from an uncreative instructor. My boredom is no one’s problem but my own, but it does pose a challenge to my goal to be present. I’ve talked so frequently about the importance of being present, and how it’s essential to peace of mind and happiness*. Chris told me last night that only two short years ago, I was never present. (I think that’s an exaggeration, maybe almost never present. But I digress.) So to be where I am today (often present, usually present, something along that line) is a huge big-deal for me, and it has made an enormous difference in my ability to stay centered, calm, peaceful and access my creative and spiritual side. With it, I believe I have grown my personal power. Until I get bored or frustrated. Frustration is a bit easier, as I can just look at my feelings with amusement, that something trivial, like an excruciatingly slow driver, can get me out of the moment and into my judgmental left brained self. Twenty miles per hour under the speed limit? Hahaha. But boredom? I have found no salve for that one. Boredom is actually standing in my way right now. My gym, the YMCA, for years has had three locations near my home so I can luxuriously pick from among the array of classes, instructors and times to find a class that solves my exercise ennui. I have managed to keep a regular fitness schedule for years, until they’ve all but eliminated most cardio classes and replaced them with repetitious, boring, conditioning classes. The remaining cardio classes are taught predominantly by the most uninspiring instructors. Consequently, my workout routine has gone down the drain. The weight room? The treadmill and weights are repetitious by definition. Boredom also gets in my way in my relationships. When someone talks about a topic that has a been there-done that quality to it, I just tune out. I can’t help it. And observing this phenomenon in myself does not help me re-engage because they’re still talking about something painfully dull once I notice (and try not to judge) my boredom. When our boys were young, they were obsessed with Pokemon and would talk literally incessantly about the intricacies of each character and their battles. It seems my blank and glazed-over look must be permanently seared into their fragile psyches. I can’t imagine this is good for any of my relationships or work productivity/creativity. So, folks, there is my dirty secret and I confess that I have made no progress on this front whatsoever. But acceptance is the first step for growth. But I’m not going to sit and wait for something to happen, because, well, it’s like watching paint dry. Here is a blog I started to write about my breakfast boredom. I didn’t publish it because I thought you’d find it ….dull. I have had between 17,000 and 30,000 breakfasts in my life, give or take a few. I’m not sure because I love breakfast and eat it early and often. Trouble is, I get bored easily – with food, with a book, with a TV show, you name it. I also don’t want to put that much effort into breakfast since I’m usually dining alone. So, let’s put the FUN back into breakfast! 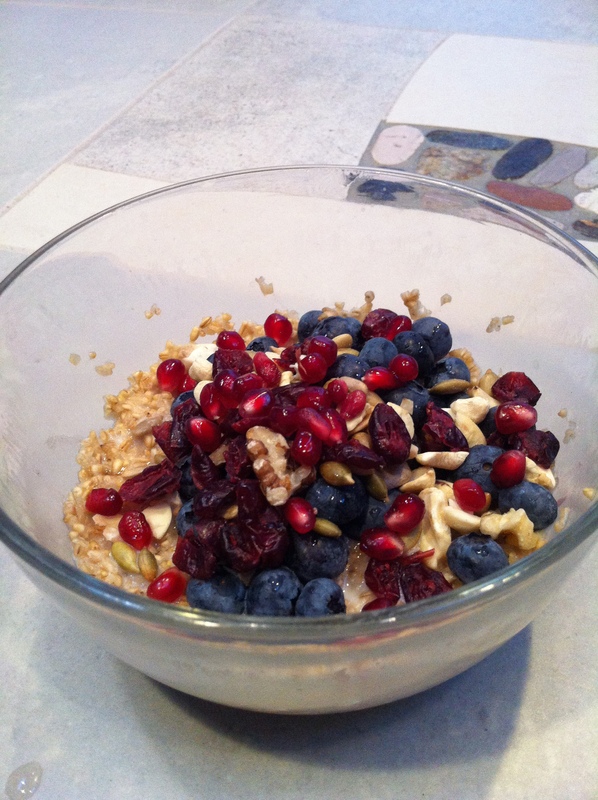 How do you keep breakfast delicious, interesting, healthy yet satisfying? Toast spread with butter and avocado – add a little salt and pepper – divine! Quesadilla – tortilla with cheese, add salsa and avocado. Maybe not so healthy. Nor is my brie toasted on artisan bread. Oh well. I love the above but I’ve had them, oh, 4-5,000 times so needless to say, even they are getting old. Other things, like smoothies or cereal just don’t fill me up or hold me for long. What do you love for breakfast?